This past weekend we made our way down to The Pearl for ‘The Big Reveal‘. The idea was a great one, several Pearl merchants would reveal special holiday windows all at once in a grand event. The unfortunate thing was it was a complete non-event. 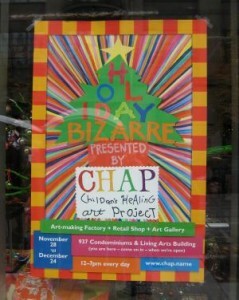 The only real saving grace was that we stumbled upon CHAP’s (Children’s Healing Art Project) Holiday Bizarre (which runs till the 24th of December). Located at 937 NW Glisan St, this special holiday bizarre features a number of DIY crafts and activities for kids. While we were there they had a woman working with the kids to make little pocket pals for $1.50! Talk about a great stalking stuffer. In addition to pocket plas there are worskops for: animation, screen printing, clay critters, orgami, collage and more (see the complete schedule of workshops). The Holiday Bizarre also features a huge collection of samples from Columbia Sportswear. Many of the samples are one of a kind. Prices ranged from $5 to $40 with some incredibly good bargains for quality clothing (some of the clothes has ‘sample’ written on them, so pick carefully). 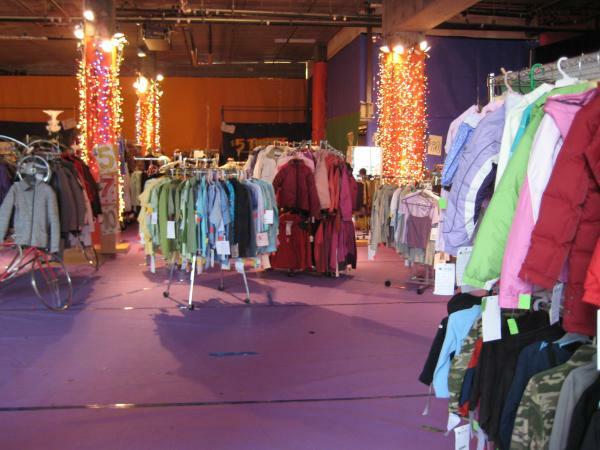 The bizarre is not only a great spot for kids activities and an opportunity to pick up a steal of a deal on some sportswear, the CHAP’s Holiday Bizarre supports a very good cause. So if for no other reason than to support a fantastic local cause, I recommend visiting this bizarre!